we need a new fence to replace chain link fence. I think it is about 35ft length and 6 foot height. 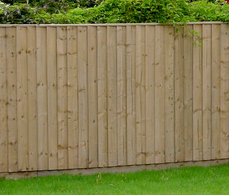 It needs to match existing fence which is the standard overlapping (closed board?) variety. please can you provide an estimate? Peter is a friendly chap and clearly knows his stuff. He and his team completed the fencing job efficiently. Very happy with the quality of the work and got good advice about our garden in general. Will use again.